Heritage Bay is a 718-acre, bundled golf community located on Immokalee Road east of Naples, Florida. The community is bordered on the north by the fabulous, pristine 1,800-acre Rookery Bay Swamp. The homes in Heritage Bay line the 27 fairways and nearly as many lakes that make the community so desirable for home buyers migrating to Southwest Florida. Three nine-hole courses are designed for golfers of all skill levels, offering enough wide landing areas to keep the average golfer out of trouble and enough hazards to keep the experts challenged. The Terraces is a neighborhood of four-story condominium buildings with 30 residences in each building. All three two-bedroom, two-bath floor plans come with covered parking. The units range in size from the Ashbury at 1,194 square feet to the Colonade at 1,408 square feet. The 1,232 square foot Brookside features a dinette area with bay window and direct access to the lanai. Each unit has a non-invasive foyer-style entry not commonly found in condos of this size and type. The Estates at Heritage Bay are single-family homes with attached three-car garages and bay windows in the some master suites. The Oakmont model has three bedrooms, three baths and a den in 2,361 square feet of living space. 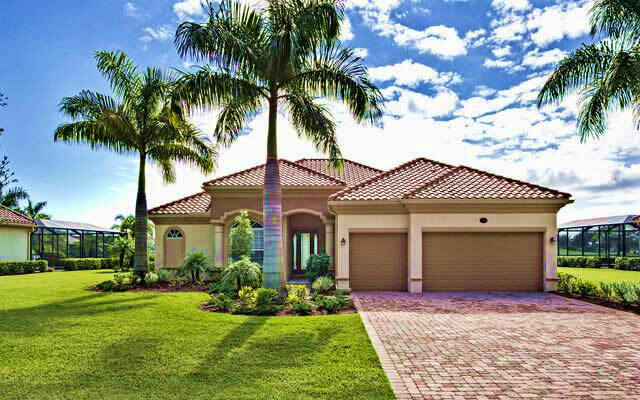 The Doral is a four bedroom floor plan with 2,553 square feet of Southwest Florida luxury with a covered portico entry. The three-bedroom Bayhill features angular walls that create a sense of grandeur and elegance. Sawgrass is a 2,926 square foot four bedroom with separate living room, family room, and den. The clubhouse area, always the centerpiece of a golf course community, is one of the finest in the Naples area. The 27,000 square foot clubhouse itself was completed in 2009 and is home to an 8,000 square foot fitness center, a luxurious resort-style pool and spa, and the Grille Room where both casual and formal dining are available for Heritage Bay residents and their guests. A Card Room, Library, and Billiards Room are also available. Seven Har-Tru tennis courts, including one with grandstand seating, are just a few feet from the clubhouse and pool. Children who are residents of Heritage Bay attend either Corkscrew Elementary, Oakridge Middle, or Palmetto Ridge High School, each of which is close to the community. The elementary and high schools are adjacent to each other. Many residents take advantage of the proximity to the unique Audubon Corkscrew Swamp Sanctuary on the other side of Bird Rookery Swamp. Its 2.25-mile trail and boardwalk are an experience unlike any other. Close enough to the beach, yet secluded enough to enjoy everyday life. That is Heritage Bay.